We are glad to introduce you our new game with animals for kids - Funny Chicken! 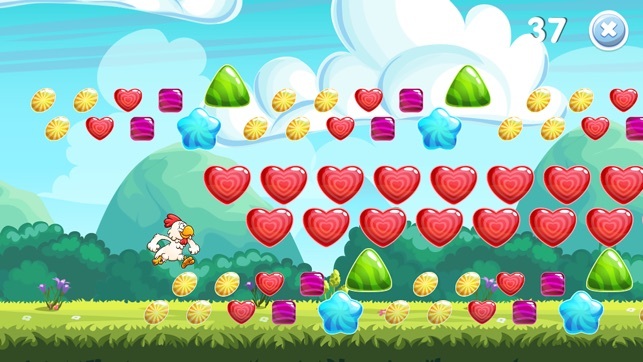 In this game the chicken collects various decorations on the run and receives prizes and bonuses for it. Whoever collects more points becomes a winner. At the end of each level new words will be written and pronounced, as well as a name of an animal or other object with a description and explanation in English. 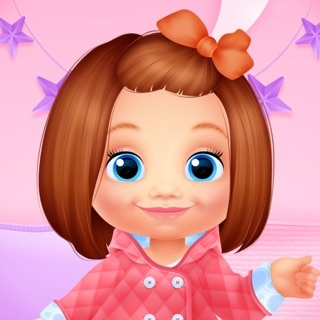 This is one of the best first apps for kids. The game for boys and girls consists of many levels. Each level has its own complexity and is designated by a specific number. 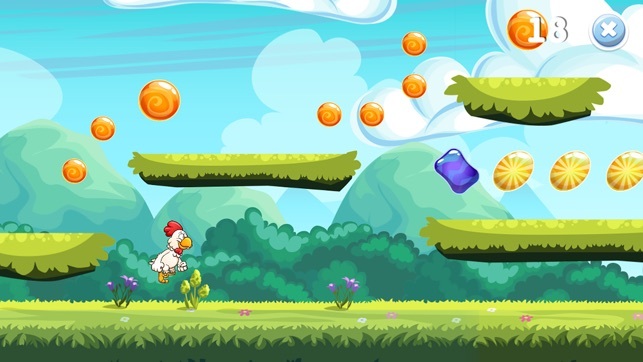 The main hero of the clever game for children is Funny Chicken, which can run fast, jump on hemps or over obstacles, and overcome various barriers such as large stones, fences and others. Your main task is to help the chicken to collect as many bright jewelries as possible and get more points at the end of each level. In this game for girls and boys, each jewel has its own size, color and shape: circles, triangles, squares, diamonds, pentagons, hexagons, etc. You can get a certain number of points depending on the size, color and shape of the decoration: the larger the size, the more colors and the more complex the geometric shape of the decoration, the more points you can get for it. During each level you should always try to get the highest amount of such jewels. Some bright big gems give 100 points at once; one such pebble will help to leave competitors far behind. 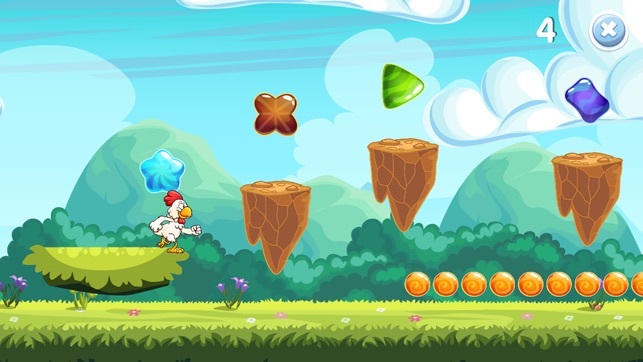 Some of the gems in this app for kids are also boosters, that will speed up our Funny Chicken for some time and help you to pass the obstacles faster. Please note that the right corner of the screen displays the number of points collected per each game for kids. It is possible to keep track of the number of points, and this is especially useful when several children take turns playing the game and compete for the total number of points scored. Each level of this children game is about to be over if you see a henhouse. At the end of such chicken coop a child learns a new word or a name of an animal, for example a cat. 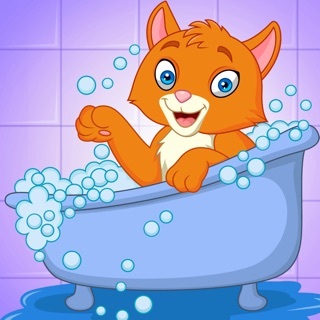 Thus, children will learn what letters the word "cat" consists of, how it is spelled correctly and pronounced in English, each letter and the word as a whole. This is one of the best games for learning English for the kids’ early development. You can always choose any level of the game. But we strongly recommend starting from the first – the easiest, then the second, and so on in order of complexity. 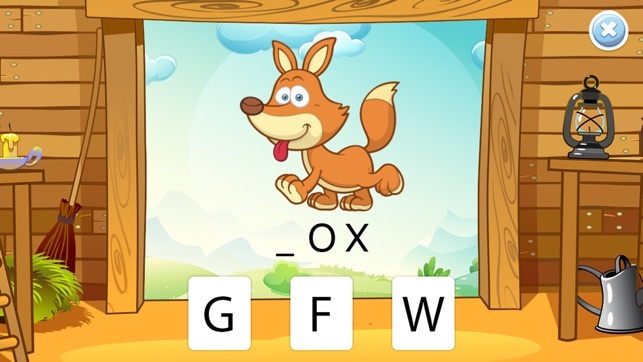 With the help of the game for girls and boys - Funny Chicken, kids will learn to recognize colors, sizes and geometric shapes of objects, and will also begin to memorize the letters, words and names of animals. Install Funny Chicken right now! My 1 year old's favorite!! My daughter is 1yr5mo and started playing baby games game about 4 weeks ago. At first she couldnt even drag the pieces on her own but mastered that in about a week and a half. Soon after she was able to identify the correct pieces and plays this game all by herself like a pro! In fact, in such a short time this game is too easy for her! She’s ready for her next challenge. This toddler game did a great job of teaching her phone basics and playing with shapes. I let my little brother play on this app and he really enjoys playing the baby games. There are lots of cool toddler games and they are all really fun and have a strong educational core. Lots of visual animations and sounds. The voice overs are well done and most kids games don't have the same quality. Overall, I think that this app is among the best for educational games. Our daughter is 2½ years old and autistic and we started using Baby Games with her to try and build language because she was not verbal. Now she can say the words to some of the things that pop up, she has gotten better with choosing the correct letter and can pretty much operate the toddler app on her own. I love them all.